In the previous two installments, the Imperial fleet had driven the Rebels from one hiding place to another, and the Emperor was now planning their doom by constructing a new, more powerful Death Star space station. The half-finished super-structure Death Star was seen in the distance, as an Imperial Star Destroyer moved toward it. Black-garbed Darth Vader (David Prowse/voice of James Earl Jones), the Dark Lord of the Sith with his face hidden behind a black helmet, took a shuttle from the destroyer to the space station to check on its slow progress (it was behind schedule) and speak to nervous Commander Moff Jerjerrod (MIchael Pennington). Vader announced that the displeased, unforgiving Emperor was soon to arrive, and insistent that the station be completed on time. On the desert planet of Tatooine, the two droids R2-D2 (Kenny Baker) and C-3PO (Anthony Daniels) walked along a desolate road. As C-3PO looked at Jabba the Hutt's fortress-palace in the distance, he complained that rebel Lando Calrissian (Billy Dee Williams) and Wookiee Chewbacca (Peter Mayhew) never returned in their efforts to rescue Han Solo. They had been sent by Luke Skywalker (Mark Hamill) to meet with the vile gangster. The droids were met at the gate by a mechanical arm with an electronic eyeball. Inside, they were confronted by bizarre, rhino-faced guards, and then brought further to the throne room by Jabba's lieutenant Bib Fortuna (Michael Carter). The grotesque, repulsive and bulbous slug-like Jabba the Hutt, smoking a hookah, was surrounded in his audience chamber-court by other smugglers, pirates, and thieves. 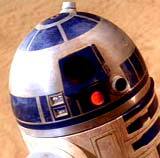 R2-D2 activated Luke's message with his holographic projector. Luke bargained for Solo's life by offering his two droids as a gift. Jabba refused to negotiate, and pointed to an alcove where his "favorite decoration" - Solo - hung on a wall, still encased in carbonite (in which Vader had imprisoned him). Jabba kept the droids, and processed them in a torture chamber. 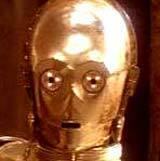 The chief administrator, EV-9D9 decided that protocol droid C-3PO would be Jabba's interpreter, since he knew six million different languages. R2-D2 was separated and taken away to serve on Jabba's Sail Barge. When taken back to Jabba's throne room, C-3PO watched as an alien band and dancers performed for Jabba's entertainment. One exotic dancing girl, Oola (Femi Taylor), who refused Jabba's invitation to come closer, was tugged on a leash and deposited through a trapdoor into an underground cavern where she was consumed by a ravenous beast. Bound up, Chewbacca was brought into the chamber by a small and strange bounty hunter named Boushh (voice of Pat Welsh), demanding payment of 50,000 (as C-3PO translated). When refused by Jabba, Boushh revealed that he was holding a small silver ball - a thermal detonator. Jabba only laughed -- then agreed to pay 35,000 for the prisoner. Chewbacca was taken away to a dungeon cell. Later that night in the deserted throne room, a sole shadowy figure (dressed like Boushh) entered, lowered the frozen Han Solo from the wall, and melted the hard shell away with a decarbonization lever-switch. Han's lifeless body was freed but fell to the floor. He revived, but was suffering from hibernation sickness. When the bounty hunter took off his helmet to reveal himself, after Han asked: "Who are you?," Princess Leia's (Carrie Fisher) face was under the mask, responding: "Someone who loves you" - the temporarily-blinded, helpless Han recognized her voice, and she briefly kissed him. As they tried to escape, they heard ominous laughter from Jabba ("Ho, Ho, Ho...") and his gang of monsters from behind a closed - and then opened curtain. Jabba refused to negotiate, threatening to turn Han into Bantha fodder, as he was led away and placed in Chewie's cell. Han's pal was overjoyed to see him. 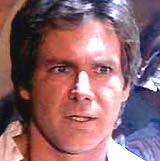 Han was disbelieving that Luke was a Jedi Knight attempting to rescue him. Captive Leia was brought over to Jabba (Lando Calrissian was disguised and posing as one of the guards), who was licking his slimy lips with his grotesque tongue in front of her. Soon after, the outer gates of Jabba's palace opened, and in strode an unarmed figure dressed in the simple cloak of a Jedi knight - it was Luke. With the mind-powers of the Force, he easily blocked attempts of guards to stop him. In front of Jabba (where Leia was chained and wearing a bikini costume of a dancing girl), Luke demanded: "You will bring Captain Solo and the Wookiee to me...You can either profit from this or be destroyed." The trapdoor was activated and Luke dropped into a pit with a monstrous Rancor, a drooling beast with sharp-fanged teeth and claws, which first consumed another hapless guard. Luke thrust a long skeletal bone of another victim in between the jaws of the creature, and then was able to crash a heavy metal door down onto the head of the beast to kill it. Hutt furiously ordered: "Bring me Solo and the Wookiee! They will all suffer for this outrage!" C-3PO interpreted Jabba's decree of termination - Luke, Solo, and Chewie were to be taken to the Dune Sea and cast into the great pit of Carkoon, the nesting place of the all-powerful Sarlacc. They would slowly be digested and eaten alive over 1,000 years in the belly of the giant creature. Looking like a Sultan, Jabba and his gang (with Leia still chained up) boarded his anti-gravity Sail Barge (where R2-D2 was serving drinks), while prisoners Luke, Han, and Chewie awaited their fate on a tiny skiff nearby. They were being closely guarded (although one of the guards was a disguised Lando Calrissian). The vessels floated and sped across the desert sand dunes to the pit of Sarlacc - where the creature's gaping mouth filled with teeth awaited them. The prisoners were to walk the gang-plank and plunge into the mouth. Droid R2-D2 snuck away to the outside deck of the barge, where it launched a concealed lightsaber in Luke's direction - at the same time, Luke jumped from the plank, catapulted off of it high into the air, flipped, landed back on the skiff, caught the light-saber, and activated it. Luke attacked the guards (with Lando's aid), some of whom ended up in the pit, and the prisoners were freed. Rocket-pack-propelled Boba Fett and the second skiff of guards attacked, ending up with Boba Fett tumbling into Sarlacc's gaping mouth. Lando was also precariously dangling from a loose cable over the pit close to the monster's mouth with Han hanging above him from the skiff to assist, while Chewie was injured. Inside the barge, Leia wrapped her chain around Jabba's neck, pulled it tight, and strangled the vile gangster to death. She freed herself with R2-D2's help and they both escaped to the deck, where Luke used his lightsaber to fight off the guards and silence one deck gun. Both R2-D2 and C-3PO fell off the barge into the sand, as Luke ordered Leia to take charge of another deck gun, point it at the barge, and destroy it. They swung together on a rigging rope to the skiff as the barge exploded. The skiff took off, picked up the two droids with heavy magnets, and they all sailed away safely. "In time, he will seek you out. And when he does, you must bring him before me. He has grown strong. 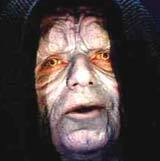 Only together can we turn him to the dark side of the Force...Everything is proceeding as I have foreseen." "One thing remains, Vader. You must confront Vader. Then, only then, a Jedi will you be. And confront him you will." As he faded in strength, Yoda confirmed that Vader was his father ("Your father he is"), reminded him: "A Jedi's strength flows from the Force," told him to avoid going down the dark path to anger, fear, and aggression, and also warned about the Emperor: "Do not underestimate the powers of the Emperor or suffer your father's fate you will." Yoda told Luke he would be the last of the Jedi, but that the Force ran strongly in his family: "Pass on what you have learned. 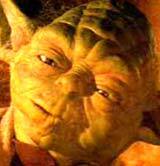 Luke, there is another...Sky - walker" - and then slowly faded from Luke's sight - to go to eternal rest. "Your father was seduced by the dark side of the Force. He ceased to be Anakin Skywalker and became Darth Vader. When that happened, the good man who was your father was destroyed. So what I told you was true from a certain point of view." "The other he spoke of is your twin sister...To protect you both from the Emperor, you were hidden from your father when you were born. The Emperor knew, as I did, if Anakin were to have any offspring, they would be a threat to him. That is the reason why your sister remains safely anonymous." 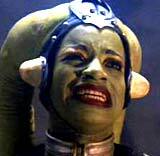 Luke guessed, insightfully: "Leia is my sister!" The vast Rebel fleet of well-armed ships stretched across space. Inside its largest ship, the Headquarters Frigate, Rebel commanders assembled to prepare for battle against the Empire. 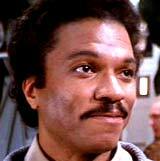 Lando Calrissian had been appointed General to lead the Rebel fleet attack. 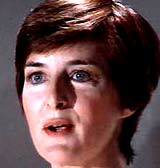 The beautiful Mon Mothma (Caroline Blakiston), the leader of the Rebel Alliance, announced that the time to strike had come, since they had pinpointed (through Bothan spies) the location of the new, "relatively unprotected" and unfinished Death Star (without operational weapons) - and the Emperor was on board. The Death Star was orbiting the forest moon of Endor, which protected and defended it with an energy shield. If the shield was shut down and deactivated, Rebel fighters could penetrate the Death Star, target its main reactor, and destroy it. A small Imperial shuttle the Tydirium (disguised as a cargo ship) had been stolen, and under this guise, a strike team would land on the moon of Endor and deactivate the shield generator. Solo had volunteered (with Chewbacca as co-pilot) for the dangerous mission on the shuttle to Endor, and he was soon joined by Leia, Luke (who just returned from Dagobah), and the two droids. In the docking bay, Calrissian agreed to take Solo's Millennium Falcon, promising him to return it without a scratch. Han fired up the Imperial shuttle's engines, and they flew off into space in hyperspace, and passed through the Imperial forces' deactivated shield without incident. On board the Death Star, however, the Emperor could foretell everything that the rebels had planned, and readied a trap. He ordered his fleet to the far side of Endor - and then told Vader to await his orders on his command ship. As they approached Endor, even Vader sensed Luke's presence and told his commander: "Leave them to me. I will deal with them myself." The shuttle landed in a forest clearing among the giant trees of Endor. The strike team, composed of the crew, moved toward the Imperial base-bunker where the shield generator was located. They encountered four storm-troopers on scout patrol riding speeder-bikes. After being spotted, Chewie shot one off his bike, while Han fought another. Two others took off to warn the base, and Luke and Leia gave chase and pursued after them. Luke jumped onto the back of one of the bikes, threw the scout off, and continued flying on the separate bike next to Leia, chasing the remaining scout. Two more scouts attacked them from behind. Luke fired at one soldier, who lost control of his bike and crashed/burned into a tree. He then chased the second scout. Leia continued her high-speed pursuit of the fleeing biker, who fired his blaster at her and hit the bike. It crashed as she lept off onto the forest floor, and as the biker looked back and laughed - he flew into a tree stump where his own bike exploded. Luke then caught up to the last remaining biker and locked bikes next to him. Losing control, Luke jumped clear as his bike broke free but then hit a tree. The biker circled back and fired his blaster at Luke, who defended himself with his light-saber. He eventually chopped off the bike's front steering vane and the scout crashed. 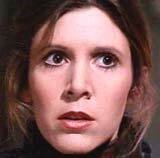 When Luke returned to Han and the other rebels, Leia was still missing. The rebels split up - the main squad proceeded to the shield generator, while Han, Chewie, and the droids searched for Leia, with plans to meet up at 0300. She had already been located by a short, furry bear-like alien creature with brown eyes named Wicket (Warwick Davis) - an Ewok, who prodded her with his spear. After they became acquainted, there were two blaster shots in their direction and a stormtrooper scout called out: "Freeze!" The Ewok slashed the scout in the leg from his hiding place under a log, and Leia knocked her captor unconscious with another log. She then shot his blaster at a second scout who was flying away, and managed to crash his speeder-bike. The Ewok led Leia into the deep forest. On the Death Star, Darth Vader entered the throne room of the Emperor, who was guarded by red-robed Imperial Guards. Vader reported: "A small rebel force has penetrated the shield and landed on Endor...My son is with them...I have felt him, my master." The Emperor noted: "Strange that I have not. I wonder if your feelings on this matter are clear, Lord Vader." Vader was insistent that he was 'clear' - the Emperor ordered Vader to the sanctuary moon to wait for him. The Emperor had foreseen that Luke would come to him, and predicted: "His passion for you will be his undoing. He will come to you, and then you will bring him before me." Back on Endor, the Rebels located Leia's crashed speeder-bike and helmet, but there was no trace of her. Chewie's nose led him to the remains of an animal carcass on a pole - it was a trap, and the group was snared in a large net and hoisted high into the air. After R2-D2 cut the netted rope with a spinning blade and they fell to the ground, they were surrounded by spear-wielding Ewoks. The creatures were fairly harmless, and thought that C-3PO was some sort of god, but the droid was stubborn in using this to his advantage: "It's against my programming to impersonate a deity." As they arrived at the Ewoks' tree village, C-3PO was treated like a king (carried in a litter and placed on a throne), while the others were bound as captive prey, and it looked like Han might be roasted for dinner ("I have a really bad feeling about this"). Leia emerged from one of the Ewok huts, asking that her friends be released. Soon, they were freed after Luke used the Force as a magic trick to raise C-3PO's throne chair, to scare the Ewoks into complying. Around the campfire in a meeting-lodge, Ewoks listened as C-3PO told them the entire story - with sound effects - of the Empire (the Emperor and Darth Vader) and the Rebel Alliance fighting against it. 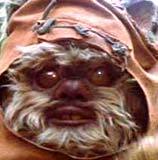 Inspired by the rebel's heroism, the Ewoks made them "part of the tribe" as honorary members and pledged to help them. The Ewok scouts would show them the quickest way to the shield generator. Luke and Leia went outside, where she realized he was troubled. Leia recalled her distant past as a young girl - she had lost her sad mother, and then the Empire had killed her father, family, and friends. Luke explained his worries: "Vader is here, now, on this moon...I felt his presence. He's come for me...I have to face him...He's my father." And then he added: "The Force is strong in my family. My father has it. I have it. And my sister has it. Yes. It's you, Leia." She admitted that she wasn't very surprised knowing they were related: "Somehow, I've always known." 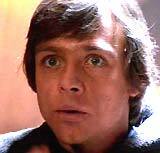 Luke believed he had to stay and confront Vader, because there was good in him: "He won't turn me over to the Emperor. I can save him. I can turn him back to the good side. I have to try." Although Leia thought Luke's plan was too dangerous and encouraged him to run away, Luke left and disappeared into the forest. Darth Vader took a shuttle from the Death Star to a landing platform on Endor. He met up with an Imperial-Walker carrying precious cargo. Luke had surrendered to stormtroopers and was brought to Vader, his father. Luke explained that he had accepted the truth that Vader was once Anakin Skywalker - although it had no meaning for Vader. He went further, pleading: "It is the name of your true self. You've only forgotten. I know there is good in you." Vader responded that his own life was no longer his own: "You don't know the power of the dark side. I must obey my master." Luke argued that Vader wouldn't turn him over to the Emperor: "Search your feelings, father. You can't do this. I feel the conflict within you. Let go of your hate." 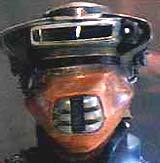 But Vader countered as he signaled for guards: "It is too late for me, son. The Emperor will show you the true nature of the Force. He is your master now." Luke replied: "Then my father is truly dead." The next morning, the Rebel strike force and the Ewoks assembled around the bunker where the shield generator was located. They learned there was a secret back entrance on the other side of the ridge. 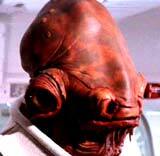 In space light-years away, the rebel Armada led by Lando Calrissian in the Millennium Falcon and Admiral Ackbar (Tim Rose) prepared to offensively strike with other Rebel fighters. All of the spacecrafts jumped to hyperspace at the same time, streaking toward the Death Star. One of the Ewok scouts caused a diversion by stealing one of the stormtrooper speeder-bikes, while the others subdued one remaining guard and entered the bunker. Vader and Luke entered the throne room of the Emperor on the Death Star. Luke was defiant when the Emperor forecast: "In time, you will call me master." He responded: "You're gravely mistaken. You won't convert me as you did my father." The Emperor disagreed: "But now you must know your father can never be turned from the dark side. So will it be with you." Luke glared back: "You're wrong. Soon I'll be dead, and you with me." The Emperor was over-confident, and sure of victory over the Rebels: "Everything that has transpired has done so according to my design. Your friends up there on the sanctuary moon are walking into a trap, as is your rebel fleet." As the Emperor predicted, a legion of stormtroopers surrounded the Rebel strike force inside the bunker. And as the Millennium Falcon approached, Lando was surprised that the deflector shield was still operational and ordered his pilots to pull up and break off the attack, avoiding a collision with the invisible shield. Another problem was discovered - the Imperial fleet was poised to attack, and the Rebels were caught between the shield and the opposing fleet. 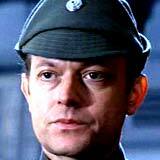 Luke helplessly watched from inside the Death Star at the space battle, where the Emperor was pleased about "the final destruction of the Alliance" and the end of the rebellion. The Emperor also noted the hate growing inside Luke as he glanced at his own light-saber, and tempted him: "Take your Jedi weapon. Use it. I am unarmed. Strike me down with it. Give in to your anger. With each passing moment, you make yourself more my servant." Although Luke attempted to resist, the inclination to fight back was "unavoidable" as the Emperor gloated: "You, like your father, are now mine." As the Rebel prisoners were led from the bunker, hundreds of Ewok warriors attacked with bows and arrows and other primitive weapons (slingshots, clubs and catapults), and the storm-troopers and giant two-legged Walkers were temporarily subdued. With the Ewoks' superior knowledge of the forest, they were able to ensnare and tangle the enemy in vines, rolling logs and lassos, lead them into pits and traps, and crush them with boulders. The delay provided time for Han and Leia to try to reopen the sealed bunker door - with R2-D2's assistance - although the droid was struck by a blast and Han had to try and hot-wire the door. 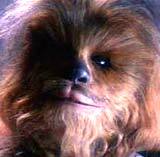 The tide of the battle turned when Chewie and some of the Ewoks were able to commandeer one of the Walkers and then use its turbolasers to blast the other Walkers and remaining troops. Once inside the bunker after a clever ploy by Han, the rebels set explosives to detonate the bunker, and the shield deflector was blown up. "Your fleet is lost and your friends on the Endor moon will not survive. There is no escape, my young apprentice. The Alliance will die as will your friends. Good. I can feel your anger. I am defenseless. Take your weapon. Strike me down with all of your hatred and your journey towards the dark side will be complete!" Luke could resist no longer - the light-saber was willed into his hand and he struck out at the Emperor, only to be parried by a light-saber blow dealt by Vader. Luke and Vader engaged in a desperate battle with light-sabers, as the cackling and gloating Emperor watched their to-the-death struggle ("Let the hate flow through you"). At first, Luke backed off and lowered his defenses, not wanting to fight his father and telling him he still believed in the good in him: "I don't believe you'll destroy me now." But Vader hurled his lightsaber at the railing support holding Luke, and he toppled to the floor. As Luke hid, Vader stalked him and advised: "Give yourself to the dark side. It is the only way you can save your friends." 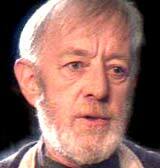 He then read Luke's thoughts, learning that he had a twin sister: "Obi-Wan was wise to hide her from me....If you will not turn to the dark side, then perhaps she will." With blinding rage, Luke was stirred to fight again, and locked lightsabers with Vader. He slashed away, and struck Vader's sword hand, slicing through his father's broken mechanical hand. The Emperor came up to them, goading Luke into killing Vader: "Your hate has made you powerful. Now, fulfill your destiny and take your father's place at my side." Luke noticed how he was becoming like Vader - they both had artificial bionic hands - but he replied as he threw his light-saber away: "Never! I'll never turn to the dark side. You've failed, Your Highness. I am a Jedi, like my father before me." The Emperor was twisted in rage: "If you will not be turned, you will be destroyed." He struck Luke down with bolts of Force energy from his hands, demonstrating the terrible power of the dark side. Luke called out to Vader to save him: "Father, please! Help me!" Watching his son in pain, the mortally-wounded Vader reacted. He picked the evil Emperor up, lifted him above his head, and hurled him down into a deep shaft in the Death Star, where his body exploded in a blast of energy. Luke cradled Vader in his arms, as the weakened Dark Lord breathed laboriously. With the shield deflector destroyed, the Rebels commenced an attack on the unprotected Death Star's main reactor. Lando Calrissian dove in the Millennium Falcon into the superstructure, targeting the main power generator through a maze of passageways, with TIE fighters close on his tail. Firepower was also concentrated by the Rebels against the Super Star Destroyer. The bridge where Admiral Piett (Kenneth Colley) was directing the fight was destroyed, and the entire craft crashed into the side of the Death Star. Chaos erupted around him as Luke dragged Vader toward a shuttle ramp. Collapsed, Vader asked: "Help me take this mask off...Just for once, let me look on you with my own eyes." The Death Star's generator was targeted and blown up by a Rebel fighter and the Falcon, and explosions rocked the Death Star. The Falcon barely escaped ignited flames as the entire space station was obliterated. Everyone on Endor watched flashes in the sky and then cheered as the Death Star disappeared. Han misunderstood Leia's love for Luke - not knowing that it was a sister's love - and he told her: "When he comes back, I won't get in the way." Leia laughed: "It's not like that at all. He's my brother." As Han sat stunned, Leia kissed him. That evening, as the Rebels were celebrating their victory, Luke burned the armored body of Vader/Anakin in a funeral pyre. The Empire and the galaxy were finally free. Fireworks rocked the kingdom. Later as the Ewoks were dancing, Luke saw the happy, ghost-spirits of Ben "Obi-Wan" Kenobi, Jedi master Yoda and then Anakin smiling at him - and he waved them goodbye. 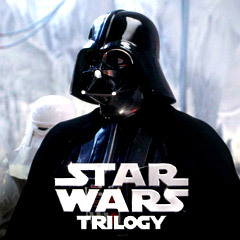 The third film of the series (in the original saga), the original series' second sequel, and the sixth film in terms of chronology. Nominated for four Academy Awards (with no wins): Best Art Direction, Best Sound, Best Sound Effects Editing, and Best Original Score. Winner of Special Achievement Oscar for Visual Effects. It was the first film to use THX technology. With a production budget of $32.5 million, and box-office gross receipts of $252.6 million (domestic), $309.3 million (lifetime domestic gross), and $475 million (worldwide). It was the highest-grossing (domestic) film of 1983, besting second place Terms of Endearment (1983) at $108 million. Set-pieces: Luke's fight in Jabba's pit with the Rancor beast, the sand-pit battle between Jabba the Hutt's barge and the skiff, the speeder bike chase through dense Endor trees and foliage, and the final duel between son Luke and his father Darth Vader in front of a cackling Emperor.